Even with just two adults, our charging situation is a hot mess of wires on the kitchen counter (you know how I hate counter clutter!) and always irritates me. I imagine as the world keeps turning and making more stuff we need to charge this will only get worse. Driven by Decor hacked a great solution to the problem using a readymade desk organizer but the I haven't been able to locate the same piece to hack. 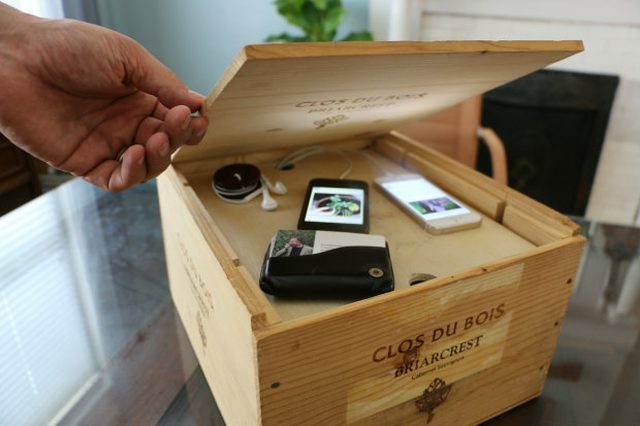 eHow featured a cool idea for a hidden version using a wine crate but I don't have a great spot so something so large. 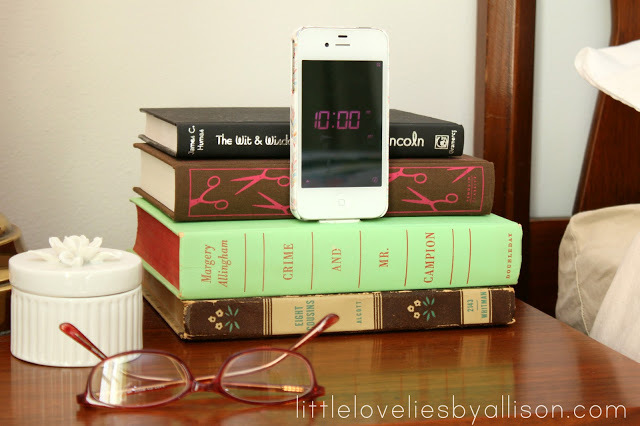 This book stack hidden charging station by Little Lovelies is totally genius but I'd have to kill too many books to charge all of our gadgets. Anyone else come up with some genius solution to share? Or should I just wait for wireless charging to come around? Oh wait, you can combine them... that would stick out pretty far, though. Thats a nice quick option but we have so many gadgets that need different plugs - so I think i need something more robust. 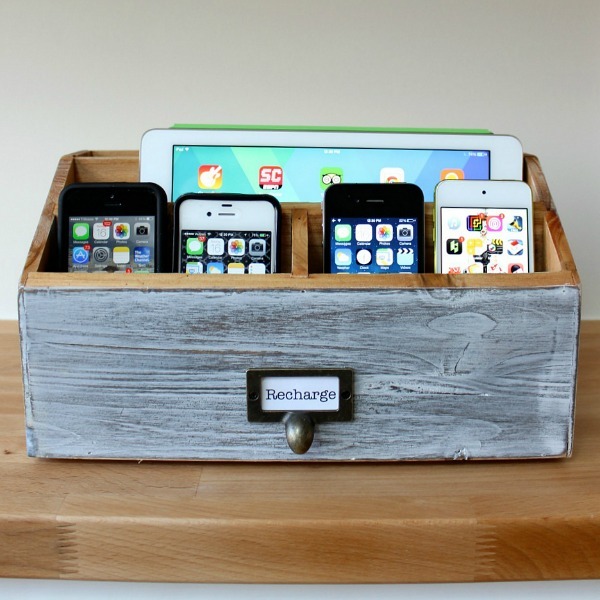 I plan on using a wooden bread box for mine. Oh I'd love to see how yours turns out. Perhaps an old drawer and make some dividers yourself? Or you might find a wooden cutlery box up at the flea market? An excuse to go to the flea market? YES PLEASE! Did you see the first idea also has a link to a Target option, available online? Wireless charging has come around. Doesn't ikea have a line of stuff? We sacrificed a drawer in an old chest of drawers that I keep in our entryway; my husband just attached a powerstrip to the back of the drawer and drilled a hole in the back for the cord. I like it because everything is hidden away. But I know storage space is a premium in your neck of the woods and you may not be able to spare the drawer. We are a bit short on drawer space but that is kind of genius. Might have to clear out a junk drawer to have the charing. I wonder if I have the space behind our drawers to attach a power strip? Smart. I would not have thought of the mesh organizers but the grommet totally makes it workable.